Joboshare MP3 CD Burner is excellent MP3 CD Burning and Audio CD Burning software, which can burn MP3 CD and Audio CD from audio files like MP3, WMA, MP2, WAV, FLAC, M4A, AAC, AC3, AU, APE. 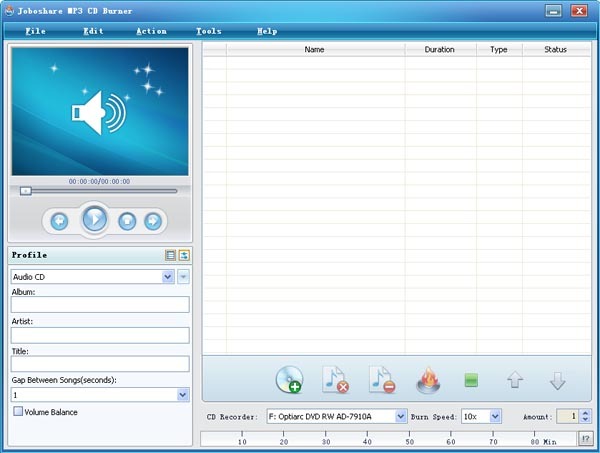 The MP3 CD burner software can also burn MP3 CD from video files, such as AVI, MPEG, WMV, MP4, MOV, 3GP, ASF, RM, RMVB, MKV, etc. ...... the source file information before CD-burning. With the simple and concise interface, burning MP3 CD files will be in a wink.Compared with other MP3 CD Burner software, Joboshare MP3 CD Burner makes music on Audio CD burning, MP3 CD burning, and WMA CD burning much easier and faster. Enjoy chunks of music with CD player anytime and anywhere. Don't hesitate, free download Joboshare MP3 CD Burner to burn music CD from MP3 and other video/audio files now! Qweas is providing links to Joboshare MP3 CD Burner 2.0.5.0708 as a courtesy, and makes no representations regarding Joboshare MP3 CD Burner or any other applications or any information related thereto. Any questions, complaints or claims regarding this application Joboshare MP3 CD Burner 2.0.5.0708 must be directed to the appropriate software vendor. You may click the publisher link of Joboshare MP3 CD Burner on the top of this page to get more details about the vendor.